Handing over the keys to a new driver can be exciting and terrifying at the same time. Before you hit the road with your teen driver, you may be asking yourself a few questions about getting them insured. If you're wondering when to add your teenager to your policy, whether you should add them at all, or if they qualify for their own policy, look no further. Read on to learn the answers to common questions about car insurance for teens! 1. Should I call my insurance company the minute my son or daughter gets their license? Insurers generally require that all drivers living in the household are listed on a policy, so adding your son or daughter to this list could help prevent a disaster later on, if your teen ends up being involved in an auto accident or gets pulled over within the first few days of their newfound automotive freedom. 2. How will my policy change, if my teen wants to get a job delivering pizzas? If your teenager is transporting goods for a fee, whether it's pizzas, cupcakes, sandwiches, or flowers, your personal policy likely won't cover them if they're involved in an accident while working. If your new driver is interested in taking a delivery job of any kind, talk to your insurance agent about additional coverage options. Depending on the situation, your teen may be eligible for their own commercial policy. 3. My teen driver only has a learner's permit. Do I need to add them to my policy? Maybe. It depends on your state's insurance requirements and your insurance company. Sometimes your current policy will cover your young driver until they receive their driver's license. While a good portion of states don't mandate that drivers with learner's permits have insurance, all states (except New Hampshire) require licensed drivers to carry insurance. 4. Are there specific insurance coverages for teen drivers? There aren't any required coverages unique to teens, but there are some coverages that could be especially beneficial for rookie drivers. Beyond the state required coverages, you may want to take a second look at Roadside Assistance. According to a 2016 article on automotive IQ, 48.38% are completely clueless when it comes to basic car-related tasks.1 Have you talked to your teen about basic car maintenance? 5. Are there discounts for teen drivers? Yes! If your insured teen has a "B" average or better for the immediately preceding semester, is less than 26 years of age, and a full-time student, your policy may also be eligible for a Good Student Discount of up to 10%. 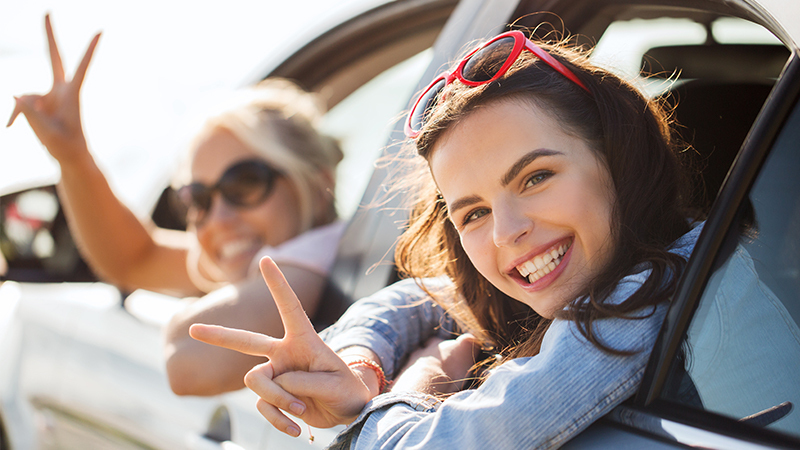 If you add a car along with your new teen driver to your existing PEIC policy, you may become eligible for a Multi-Car Discount of up to 21% when you add an additional car along with them. For more information on PEIC discounts, visit our Discounts page. 6. If my teen moves away for school, should they stay on my policy? Here's another one of those "it depends" answers. If your teen is moving to another state for school, the insurance requirements may be different. Call your insurance company to double check that the company offers insurance in the state and if need be, adjust your policy to meet the legal requirements of that state. If your son or daughter is going to another state and will not be bringing a vehicle with them, you may still want to keep them on your policy regardless. In the future, an insurance company could view this period as a "lapse," which may cause the cost of their insurance to go up. 7. Once they get their license, should my teen have their own policy? It's an option you may want to explore, but there's really no right or wrong answer as long as your teen has an auto policy that meets the state's coverage requirements. Some parents are comfortable adding their teen to their current policy, while others prefer to help their teen purchase a separate policy. If you're worried about your affordable car insurance policy becoming, well, not so affordable, then helping your teen purchase their own policy might be the right route for you. Before making a decision, it's worth your time to price out each option with your insurance company. Not only will this help your son or daughter better understand the costs associated with driving, but it may help you see how adding your teen to your existing policy could lead to additional discounts (like a good student or multi-car discount). If your teen is financially self-sufficient or working a steady part-time job, an individual policy may be the most cost-effective route for them, and you. Still have questions? Our friendly insurance experts are standing by to assist you. Personal Express Insurance can help you find the right coverage for your new driver. Give us a call 1-800-499-3612, and point your new driver to our 9 Tips for the Teenage Driver to help keep them safe!